For gazelle: Our double-decker bee balm flower below. 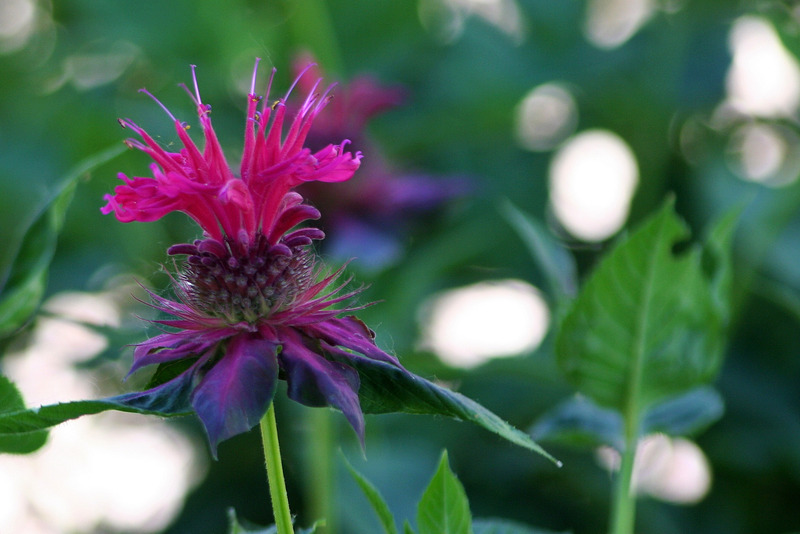 Interesting how the first photo (above), taken in soft early morning light, shows the true color of our bee balm. This second photo (below), taken in harsh mid-day light, shows a much redder flower. And how cool is this? 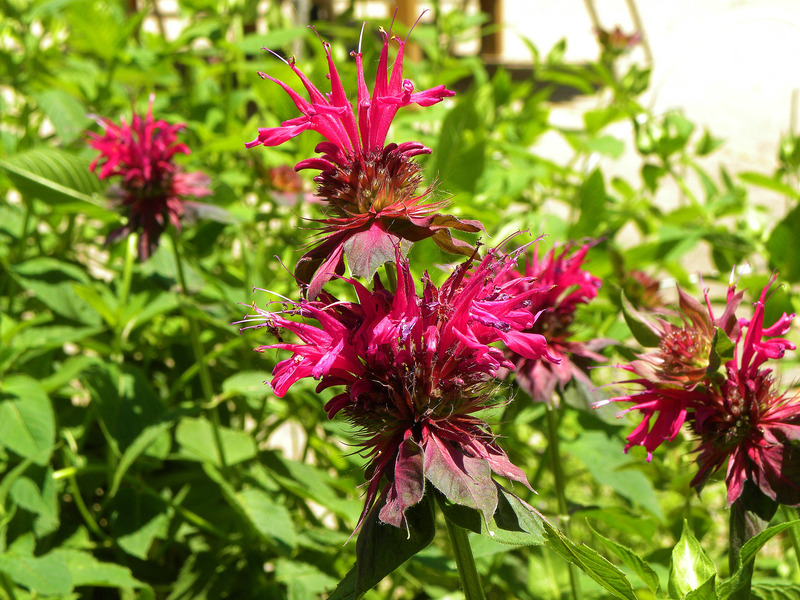 The photo below is of gazelle’s double-decker bee balm. Thank you, gazelle! I can’t wait to look through the rest of your pictures. And look at her beautiful clematis in the background! The red and the purple are stunning together, aren’t they? I’m still waiting for mine to bloom. I planted them a tad too close to the spirea and the two are elbowing each other for growing space, but when the flowers come they’ll be lush and gorgeous together. I could be looking at my own garden in this photo. Mine are blooming now, too. The humming birds LOVE Bee Balm. No wonder they built a nest on your porch swing! Such an unexpected pop of color! Love this. Aren’t they cool to look at? From a distance they are a puff of color, but up close you see so many interesting details…..
It’s so beautiful and sorry I missed it now that I am back home… miss you all! Great Shot ! 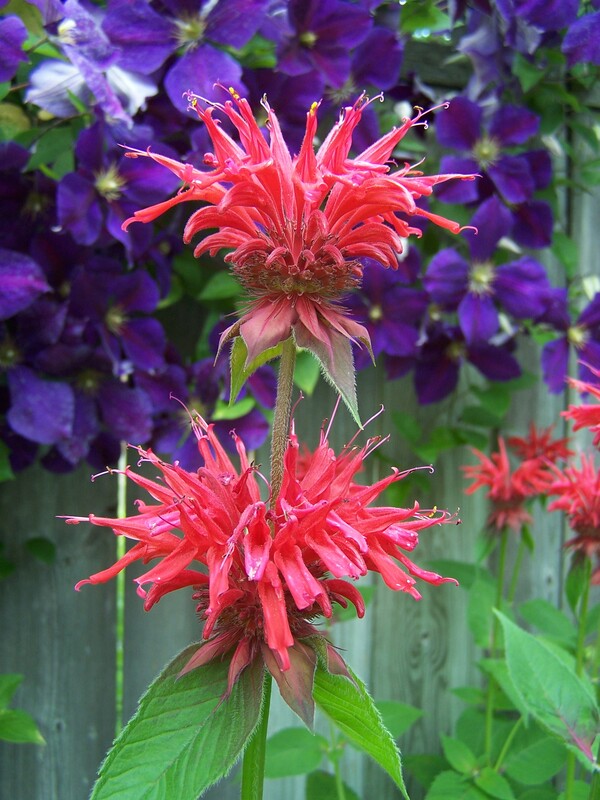 I have Bee Balm too except mine are more Red than Purple. Do you ever get a double-decker one ? I get a few every year where the stem continues on up another inch or so right through the middle of the bloom and another bloom develops right on top, and both are flowering at the same time … very interesting effect. Yeahhhh…..whatever happened with that hummingbird nest? Did you see babies? I have never seen that flower before. It’s beautiful. I wonder if it grows here. you can find them in most nurseries. they are very easy to grow. good luck!